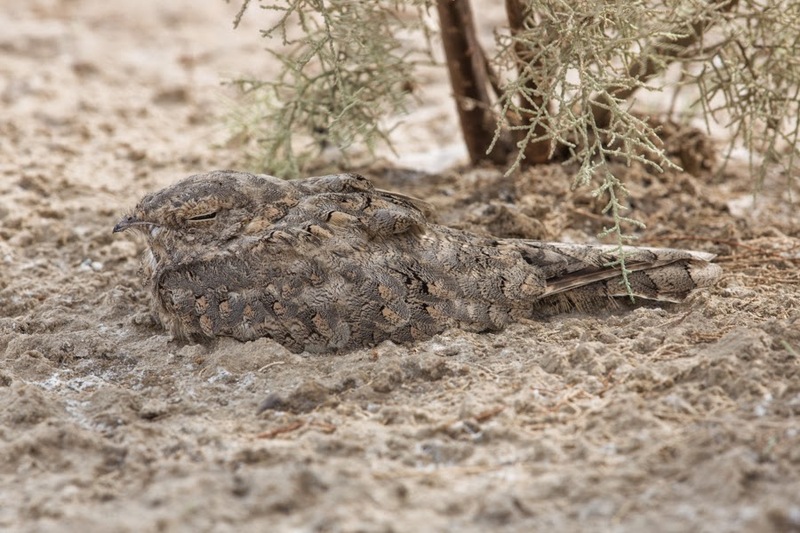 The Egyptian Nightjar Caprimulgus aegyptius is an uncommon bird in Arabia, with The birds of the western Palearctic (Cramp 1985) mentioning they winter in north-east Africa and migrate on a broad front across Arabia from September to early November & March to mid-May. Although this information is borne out by the data from Arabian countries there is little published information of summer or winter records from the region, and the recently published Birds of the Middle East (Porter et al 2010) has no mention of summer records and only a comment saying birds winter in southern Arabia, although the map depicted only shows passage birds marked. The Atlas of the Breeding Birds of Arabia by Mike Jennings (2010) mentions the Egyptian Nightjar is a scarce migrant and winter visitor but numbers are increasing, notably in the northern Arabian Gulf region, with birds present in summer since the beginning of the 21st Century in areas where freshwater can be found. He mentions over-summering has been noted in Kuwait & the Eastern Province of Saudi Arabia and mentions the species is thought likely to breed. 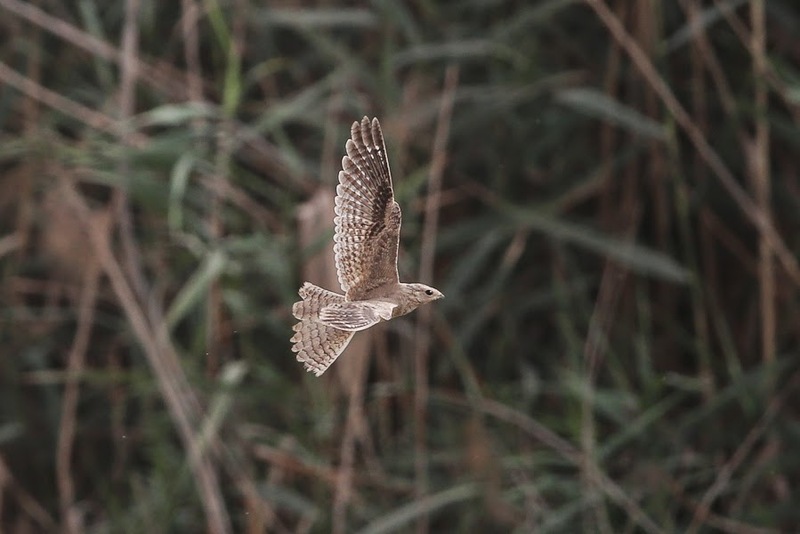 Records of the species in summer are now occurring in Kuwait, Saudi Arabia, Bahrain & Qatar with summer records occurring in the Eastern province of Saudi Arabia since 2004 when a pair was discovered at Khafrah Marsh 24th June 2004 where the possibility of this nightjar being overlooked as a breeding species was briefly discussed. 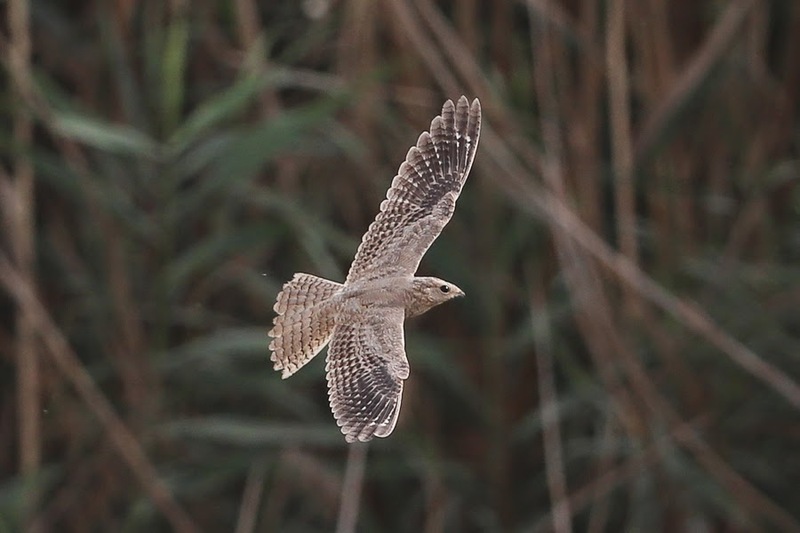 Since 2006 additional birds have been located in the Eastern province of Saudi Arabia at Sabkhat Al Fasl (Jubail) in August with the highest count being ten birds together on 22 August 2008. Birds have been seen every year in August at this site since 2006 with birds also seen in July from 2011 to date and the earliest record on the 27 June 2014. 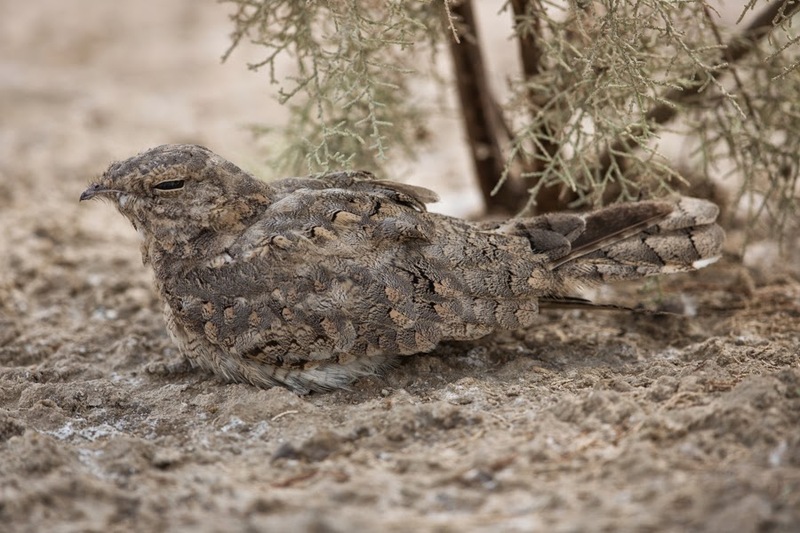 The summer records are interesting as the subspecies of Egyptian Nightjar occurring in Arabia Caprimulgus aegyptius aegyptius occurs in north-east Egypt and northern Arabian Peninsula, eastwards to extreme central-west China, north-east Kazakhstan, Tajikistan, extreme western Pakistan and south-east Iran and winters in the eastern Sahel arrives on its breeding grounds in early April to mid- May and leaves in September. Birds in Iraq arrive in mid-March and are plentiful in April and depart in September with numbers increasing in August & September (Cramp 1985). Migrant birds further to the east in Kazakhstan, where the species also breeds, occur from mid-April to mid-May and from late August to early October (Gavrilov and Gavrilov 2005). 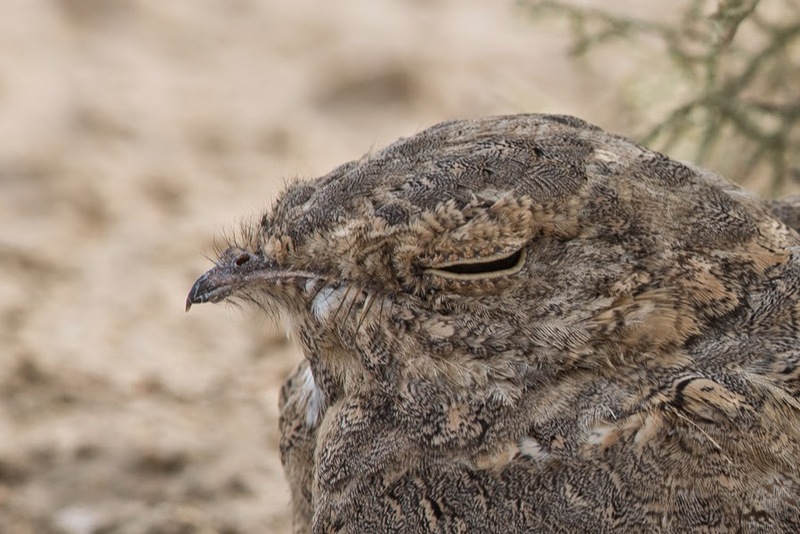 There have been no confirmed breeding records of Egyptian Nightjar in Arabia although these records indicate birds are breeding, attempting to breed, or are very early migrants to the region. It is clear that the status of the species has changed in eastern Saudi Arabia in the 21st Century, with the majority of birds no longer seen during the migration periods of early November & March to mid-May. 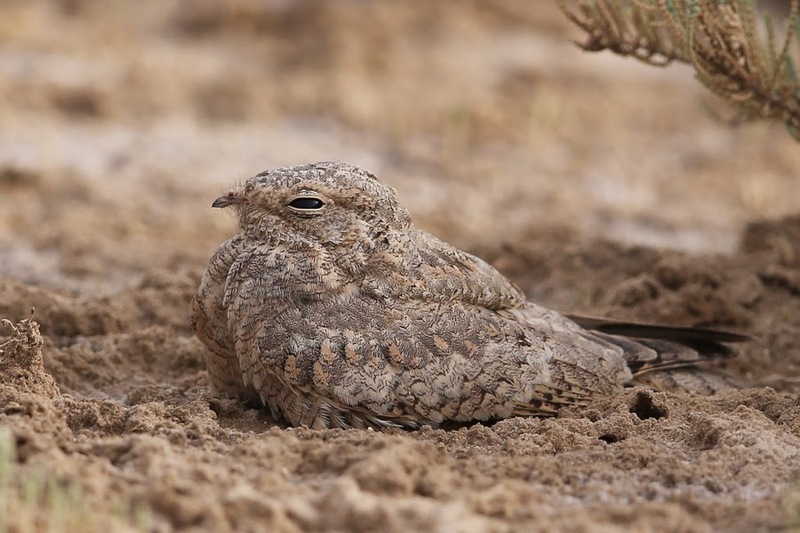 In Saudi Arabia it was previously regarded as a vagrant (Bundy et al 1989) but is now known as a scarce passage migrant, summer and winter visitor, with July & August the best period for locating them. All the above photos were taken by me at Sabkhat Al Fasl 18 July 2014 when a minimum of three birds were seen. Sabkhat Al Fasl is certainly the best place in Saudi Arabia for seeing the species and one of the best sites in Arabia as well.